In late August of 1787 Robert Burns rode into Blair Atholl in a hired post-chaise with his travelling companion William Nicol, an Edinburgh High School teacher. He was 28 years old. Less than a year before, on 28th November of 1786, he jogged into Edinburgh on a borrowed pony from his home in Ayrshire, The publication of the Kilmarnock Edition of his poems had aroused considerable interest in literary circles in the capital and Burns had been urged to try his fortune by having a second edition of his poems printed and published there. This he had accomplished through the Earl of Glencairn, head of the Cunningham family in Ayrshire, who introduced him to Creech, the leading Edinburgh publisher, and also sponsored his entry into social circles, where his wit and conversational ability made an immediate and powerful impact. He was highly intelligent and this he made evident. Dr William Robertson, the noted divine, was then Principal ot Edinburgh University and Historiographer Royal for Scotland. He said this:- "I think Burns was one of the most extraordinary men I ever met; his poetry surprised me very much, his prose surprised me still more, and his conversation surprised me more than both his poetry and prose. A remarkable tribute from such a highly educated and intelligent man with an international reputation, then aged 65! In appearance Robert Burns was a sturdily built man, 5'9" tall, who carried himself well and was possessed of considerable physical strength, dark complexioned with a strong, handsome face under black curly hair. But his most striking feature was his large and lustrous dark eyes. Sir Walter Scott, the great novelist and poet, said he never saw such eyes which positively glowed when the poet spoke with feeling. The bright young Duchess of Gordon said he carried her completely off her feet, She said it was his conversation. This then was the young man who drove up to the Atholl Arms inn and sent word of his arrival to Mr Josiah Walker, then tutor to the family of the Duke of Atholl. The Duke, to whom he brought a letter of introduction, was from home but the Duchess gave Burns an invitation to sup and sleep at Atholl House, which he accepted. The impression he made upon the Murray family, including the Duke who returned later, was highly favourable; he was certainly charmed with the reception he received from them and he often mentioned the two days he spent at Atholl House as amongst the happiest of his life. He met there Mr Graham of Fintry to whom he was afterwards indebted for his office in the Excise. Burns and Nicol had entered Atholl through Crieff, along Glen Almond and the Almond River, visited Ossian's grave, Loch Freuch, Glenquaich and Taymouth. From there they had come down the Tay to Dunkeld, Glenlyon House, Lyon River, visited a Druid's Temple (3 circles of stones) passed Taybridge to Aberfeldy, Castle Menzies, Inver - all over two days. On the Friday they went to the top of Birnam, then rode up along the Tummel River visiting Faskally and the Pass of Killiecrankie, where they viewed Lord Dundee's stone, and onto Blair Atholl. During the Saturday they visited the scenes round Blair, the Tilt and Garry rivers, Lochs Tummel and Rannoch, through the former Struan Robertson estate. His visit to the Falls of Bruar during this excursion led Burns to compose "The Humble Petition of Bruar Water" which he worked upon as he journeyed north from there and enclosed with a letter dated 5th September, 1787 to Professor Walker at Atholl House, in gratitude for his hospitable entertainment there. It is pleasing to record that the Duke acted immediately on the Petition and the Bruar soon gained the attractive woodland setting which so enhances its beauty today. "The grace be - Atholl's honest men, And Atholl's bonnie lasses!" Wi' half my channel dry. He, kneeling, wad adored me. I am, although I say't mysel'. Worth gaun a mile to see. 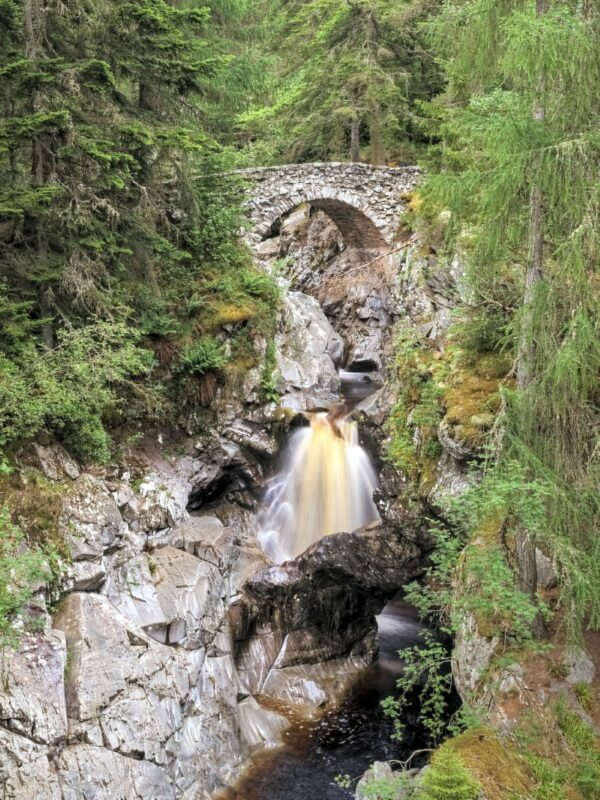 *Bruar Falls, in Atholl, are exceedingly picturesque and beautiful; but their effect is much impaired by the want of trees and shrubs.